Two days after opening the second round with their worst game of the playoffs, the San Jose Sharks responded with a gritty performance. Logan Couture’s second goal of the game, on the power play at 5:13 of the second overtime, lifted the Sharks to a 4-3 victory over the Vegas Golden Knights on Saturday night, tying their Western Conference semifinal series at one game apiece. 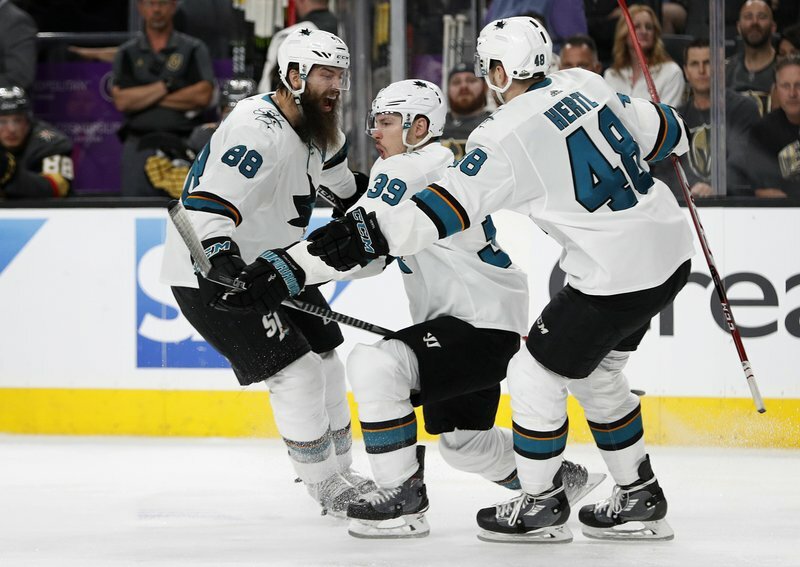 Moments after Vegas’ Jon Merrill was called for hooking, Couture found the back of the net to give the Sharks their first win inside T Mobile Arena this season. San Jose rallied from two goals down in the second period to take the lead, before Vegas tied it in the third. Vegas lost for the first time in the playoffs after winning their first five games by a 14-3 margin, including a 7-0 victory in Game 1. The Golden Knights thought they won this one in the first overtime when Jonathan Marchessault’s backhand sailed past Martin Jones with 3:02 left, but officials ruled there was goaltender interference when Marchessault ran into Jones’ blocker and spun him around before his shot. Brent Burns also scored two goals and Jones stopped 26 shots for San Jose, which was playing without suspended forward Evander Kane. William Karlsson scored twice for Vegas, while Nate Schmidt got his first of the postseason to tie the score at 3-3 with 6 1/2 minutes left in the third period. Marc-Andre Fleury finished with 43 saves. Game 3 is Monday night at San Jose. Unlike the first game of this series, which saw the Golden Knights become the third NHL franchise to score at least seven goals in a playoff game during its inaugural season, Game 2 was much more physical, something that seemingly took Vegas out of its rhythm in the second period. In Game 1, Vegas blocked 26 shots, to the Sharks’ 13, but San Jose held a 36-26 edge in Game 2. And after being whistled for 10 penalties in first series-opener, as opposed to Vegas’ five, the Golden Knights found themselves in the box more than San Jose, 11-6. The Golden Knights got on the board late in the first period when Karlsson took a rebound off the end boards and found the back of the net from a tight angle. He notched his second goal when he took advantage of a turnover and beat Jones from the circle to put Vegas up 2-0 just 26 seconds into the second. Burns brought an end to the Sharks’ 82-minute scoring drought when he picked up the puck off the draw and blasted a slap shot from the point to cut Vegas’ lead in half. Couture tied the game at 2 with a goal that conceivably could have been avoided. After blocking a shot by Dylan Demelo, Fleury pushed the puck to Deryk Engelland behind the net, rather than covering it up. Tomas Hertl got ahold of it and fed Couture, who one-timed in with just under nine minutes left in the second. Three minutes later, Burns gave San Jose a 3-2 lead after he snagged the puck off a faceoff, circled the back of the net and tucked it in on a wraparound. NOTES: Burns’ second-period goal ended Fleury’s scoreless streak of 143:51, dating back to Game 3 of the opening round versus Los Angeles. ... Vegas surpassed its season-high 13 penalties in minutes with 22 PIM. ... The 18,671 in attendance was a new team record at T Mobile Arena. ... Kane was suspended Friday because of a cross-check to the head of Pierre-Edouard Bellemare in Game 1. ... It was the second straight series the Golden Knights went into double overtime in Game 2, with their opponent missing a key player due to suspension. Los Angeles was missing Drew Doughty in the opening round.